American physicist mission specialist astronaut 1967-1985. Status: Inactive; Active 1967-1985. Born: 1937-06-27. Spaceflights: 2 . Total time in space: 13.08 days. Birth Place: Crawfordsville, Indiana. PERSONAL DATA: Born in Crawfordsville, Indiana, on June 27, 1937. Married to the former Bonnie Jo Darling of Elkhart, Indiana. They have a son and a daughter. Recreational interests include handball, squash, flying, sailing, skiing, music, and photography. His parents, Mr. and Mrs. Joseph P. Allen III, reside in Frankfort, Indiana. Her mother, Mrs. W. C. Darling, resides in Elkhart, Indiana. EDUCATION: Attended Mills School and is a graduate of Crawfordsville High School in Indiana; received a bachelor of arts degree in math-physics from DePauw University in 1959, and a master of science degree and a doctor of philosophy degree in physics from Yale University in 1961 and 1965, respectively. ORGANIZATIONS: Member of the American Physical Society, the American Astronautical Society, the American Institute of Aeronautics and Astronautics, the American Association for the Advancement of Science, Phi Beta Kappa, Beta Theta Pi, Sigma Xi, and Phi Eta Sigma. EXPERIENCE: Allen was a research associate in the Nuclear Physics Laboratory at the University of Washington prior to his selection as an astronaut. He was a staff physicist at the Nuclear Structure Laboratory at Yale University in 1965 and 1966, and during the period 1963 to 1967, served as a guest research associate at the Brookhaven National Laboratory. He has logged more than 3,000 hours flying time in jet aircraft. NASA EXPERIENCE: Dr. Allen was selected as a scientist-astronaut by NASA in August 1967. He completed flight training at Vance Air Force Base, Oklahoma. He served as mission scientist while a member of the astronaut support crew for Apollo 15 and served as a staff consultant on science and technology to the President's Council on International Economic Policy. From August 1975 to 1978, Dr. Allen served as NASA Assistant Administrator for Legislative Affairs in Washington, D.C. Returning to the Johnson Space Center in 1978, as a senior scientist astronaut, Dr. Allen was assigned to the Operations Mission Development Group. 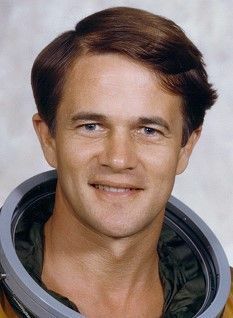 He served as a support crew member for the first orbital flight test of the Space Transportation System and was the entry CAPCOM for this mission. In addition, in 1980 and 1981, he worked as the technical assistant to the director of flight operations. He was a mission specialist on STS-5 (November 11-16, 1982) and STS-51A (November 8-16,1984) and has logged a total of 314 hours in space. He left NASA in 1985. Dr. Allen is currently Chief Executive Officer of Space Industries International, Inc., 800 Connecticut Avenue, N.W., Suite 1111, Washington, D.C. 20006. SPACE FLIGHT EXPERIENCE: STS-5 was the first fully operational flight of the Shuttle Transportation System, which launched from Kennedy Space Center, Florida, on November 11, 1982. The crew aboard Columbia included Vance D. Brand (spacecraft commander), Col. Robert F. Overmyer (pilot), and Dr. William B. Lenoir (mission specialist). STS-5, the first mission with a crew of four, clearly demonstrated the Space Shuttle as fully operational by the successful first deployment of two commercial communications satellites from the Orbiter's payload bay. The mission also marked the first use of the Payload Assist Module (PAM-D), and its new ejection system. Numerous flight tests were performed throughout the mission to document Shuttle performance during launch, boost, orbit, atmospheric entry and landing phases. STS-5 was the last flight to carry the Development Flight Instrumentation (DFI) package to support flight testing. A Getaway Special, three Student Involvement Projects, and medical experiments were included on the mission. The crew successfully concluded the 5-day orbital flight of Columbia with the first entry and landing through a cloud deck to a hard-surface runway and demonstrated maximum braking. STS-5 completed 81 orbits of the Earth in 122 hours before landing on a concrete runway at Edwards Air Force Base, California, on November 16, 1982. STS-51A Discovery , which launched from Kennedy Space Center, Florida, on November 8, 1984. The crew aboard Discovery included Captain Frederick (Rick) Hauck (spacecraft commander), Captain David M. Walker (pilot), and fellow mission specialists, Dr. Anna L. Fisher and Commander Dale H. Gardner. This was the second flight of Space Shuttle Discovery. During the mission the crew deployed two satellites, Canada's Anik D-2 (Telsat H) and Hughes' LEASAT-1 (Syncome IV-1), and operated the 3M Company's Diffusive Mixing of Organic Solutions experiment. In the first space salvage attempt in history the crew successfully retrieved for return to Earth the Palapa B-2 and Westar VI communications satellites. STS-51A completed 127 orbits of the Earth in 192 hours before landing at Kennedy Space Center, Florida, on November 16, 1984. Family: Astronaut. Country: USA. Flights: Apollo 18, STS-5, STS-41-H, STS-51-A. Projects: STS. Bibliography: 12, 5100. 1937 June 27 - . Birth of Joseph Percival IV 'Joe' Allen - . Nation: USA. Related Persons: Allen. American physicist mission specialist astronaut 1967-1985. 2 spaceflights, 13.1 days in space. Flew to orbit on STS-5 (1982), STS-51A..